HomeBlogArchive by Category "Manor Park"
It was Saturday 22nd September and the Friends of Manor Park were running another volunteer morning. It’s been just under 12 months since we ran our first such event, which incidentally was supported by over 50 local volunteers. Last year we were blessed with bright sunshine. This year, however, the skies were looking grey and rather foreboding as we set up our gazebo on the grassy area by the seasonal pond. As you can imagine, we were a little worried about how many people would turn up. 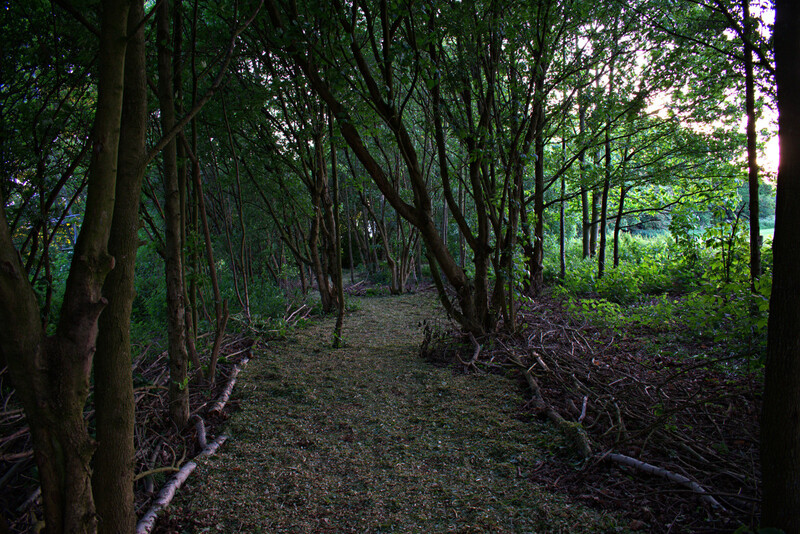 Our mission was to push back the bramble that was spreading out towards the cut-through path near the road. 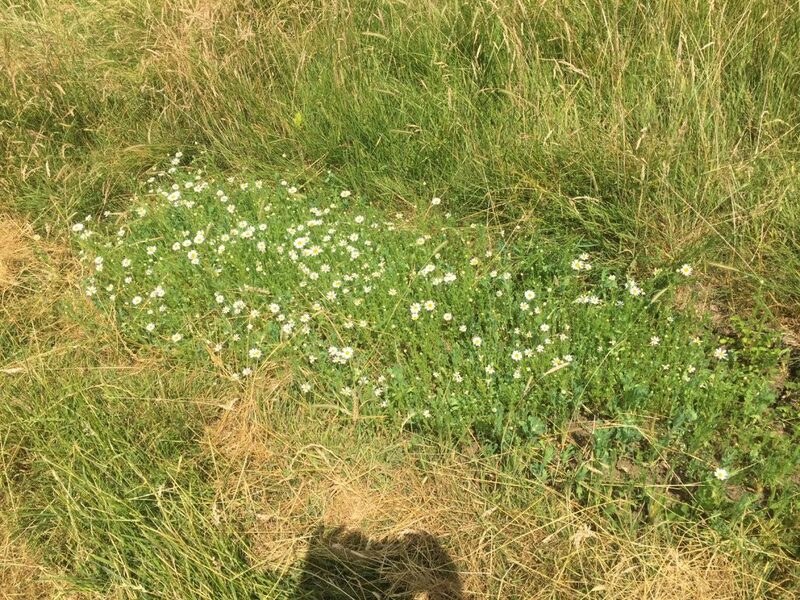 After a long hot summer, the park also needed a deep clean – with lots of litter having found its way into the undergrowth. 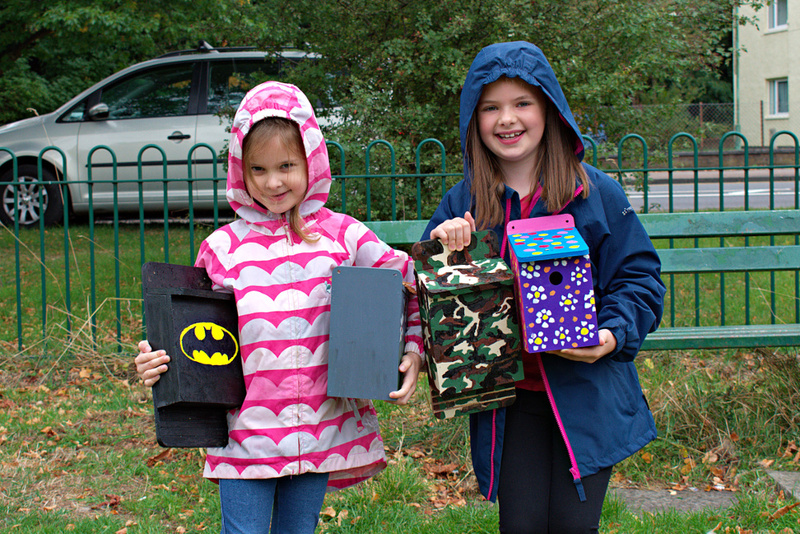 We’d also given local families some bird and bat box kits to assemble (and decorate if they were feeling creative!). 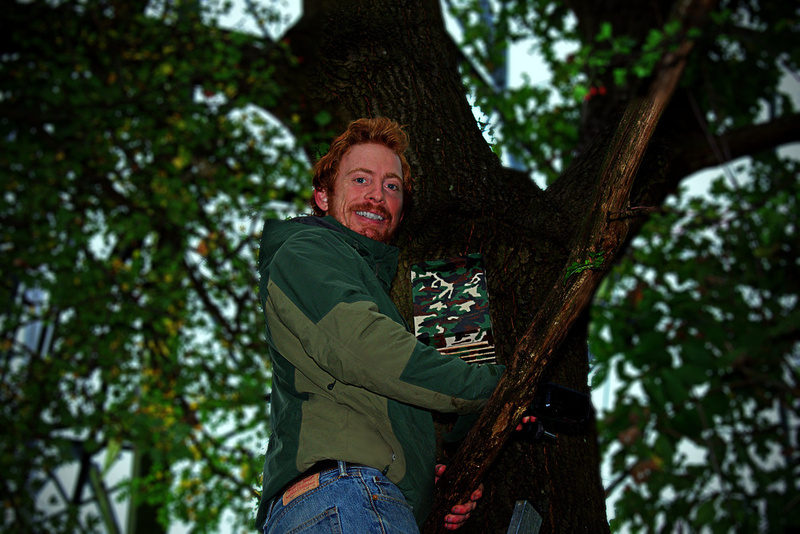 Our plan was to install these boxes in the woodland around Manor Park to create extra habitat for our winged friends. It’s also a great way to engage children in conservation type activities. My worries about turnout were soon proven unfounded, as by kick-off at 10am about 30 people had gathered by our gazebo, and over the course of the morning we counted in excess of 40. So, a really good show – particularly given how nasty the weather became. We kicked off our day with a quick update on Friends of Manor Park activities. 2019 is the 90th anniversary of our park. 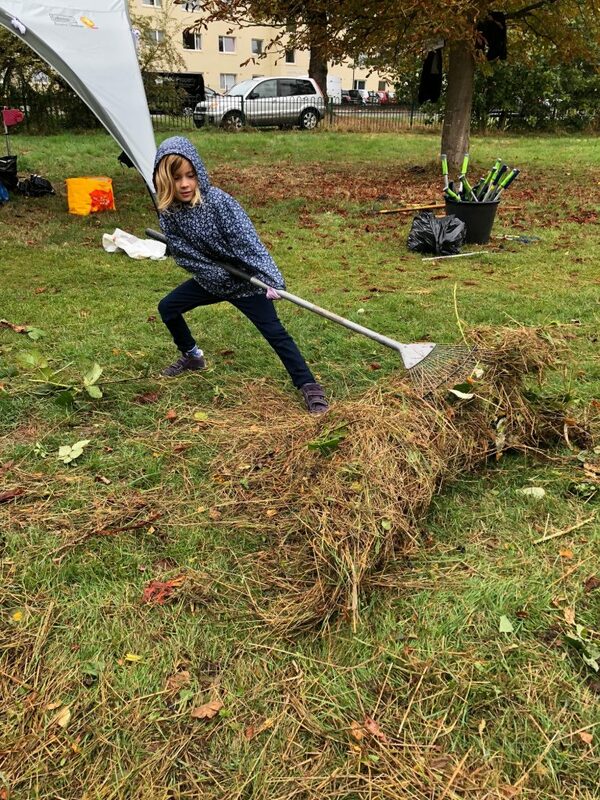 We’ve decided, following advice from the Mayor of London’s team, that it would be great opportunity to produce a five year plan for our park – which will deal with a lot of the issues that the local residents have raised e.g. improving the playground, improving security, sorting out the paths, better management of the natural spaces, improvements to the tennis courts, quality of the sports pitches, determining how the community would like to see the hall develop – some are eager for a small café – and much more besides. It’s an exciting opportunity, one which will involve the community heavily in the decision-making process, and which we hope you’ll support at this early stage by making a small pledge to our crowdfunding campaign. We handed over to Elliot Newton, our environmental expert, who took us all through the tasks for the day, and an equipment safety talk. 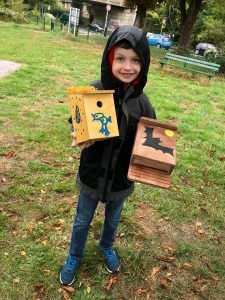 By this time some of the assembled, and highly decorated, bird and bat box kits had arrived, along with the very creative families who’d turned these humble items into works of art. Elliot headed off with these families in toe to install the boxes in the woodland. Try and find them next time you’re our exploring in the park. We’ve still got 4 more to put up – so we’ll be inviting these families down when we do this. Whilst Elliot was balancing himself precariously on a ladder in various parts of the park, another group of residents, led by Cllr Simon Edwards, were picking up litter. 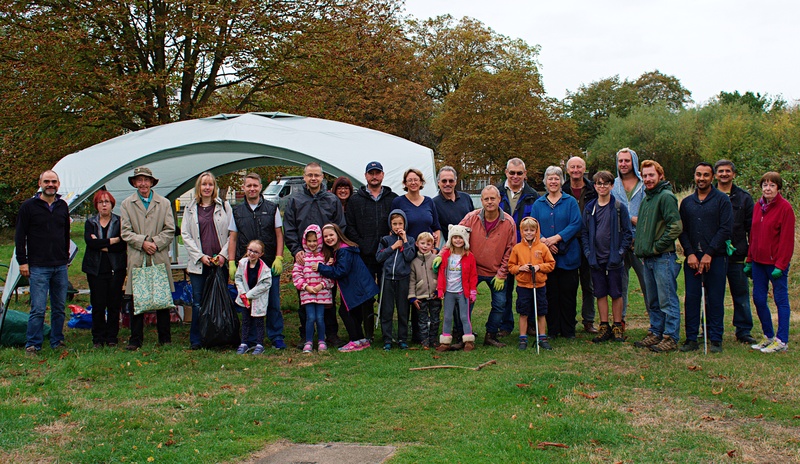 There seemed to be a lot less litter in the park than when we first blitzed it last October – which was a good sign. Simon found a small camp type area in the rear of the park where it appears people must gather for a bit of late-night drinking from time to time. It was cleared of beer cans, laughing gas cannisters, and other debris. Back in the meadow by the road, we were bashing away at the brambles. 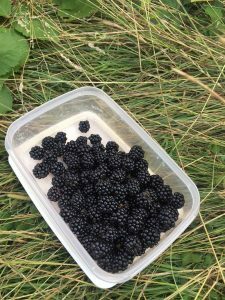 Although they provide a great natural habitat for birds and other wildlife and a wonderful harvest of blackberries each year, they do grow at quit a rate, so left unchecked they spread themselves covering over grassy areas and turning woodland into thicket. Pushing them back is easier said than done. In the wild, boar will restrain the spread of bramble, no such luck at Manor Park. All the growth that is visible is first chopped out, and then the roots have to be removed with mattocks (these are similar to pick-axes). The roots for each plant send out runners which spread the plants further and further. Amongst the bramble-bashers, we were joined by Cllr Nicola Sheppard from Old Malden, and Cllr Tim Cobbett from St.James Ward. It’s worth noting that we’ve had lots of support from all our local councillors from both sides of the political divide in the work we do to protect and improve Manor Park. 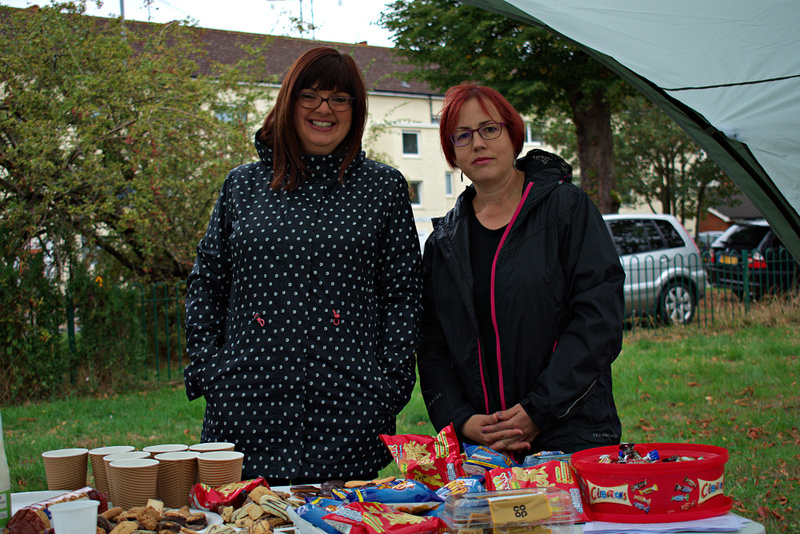 By about half-eleven the rain was coming down quite heavily – but our volunteers stuck at it. We took our tea break at midday, which was a great opportunity for everyone to meet and get to know each-other. The brambled-bashing went on all morning because we were trying to push back quite a large area of over-growth. Our volunteers managed to fill a large trailer with cuttings. We discovered a couple of hawthorn trees that had almost been assumed by the bramble. There was obviously a line of trees that had been planted here back in the 90s. We’ll look to do further work ensure these trees aren’t completely overrun. You can see in the picture below how little vegetation there used to be in this area – but following some work in the 90s it’s become a wonderful natural space. Towards the end of the day a few of us extracted several panels of broken fencing from near the corner of the privately-owned land by the railway bridge – these were some of the last remaining panels of fencing that the landowner had erected several years ago. This broken fencing had sharp metal spikes sticking out of it – so it was very satisfying to move it away from the path and stack it on the edge of private land by the railway. It’s worth noting that we are working with the Ramblers Association to assert a public right of way across this land. So, all in all a very successful day. 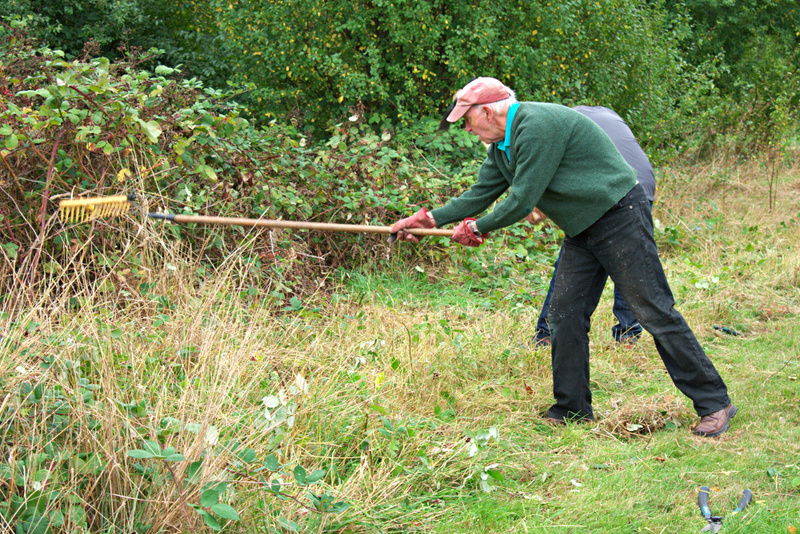 A big thank-you to all the local volunteers who gave up their time to help make our park that little bit nicer. We also appreciate the support we get from our local councillors, Elliot Newton, Andy at idverde (the park contractor), and Tesco, McColls, and the Coop for providing the refreshments. 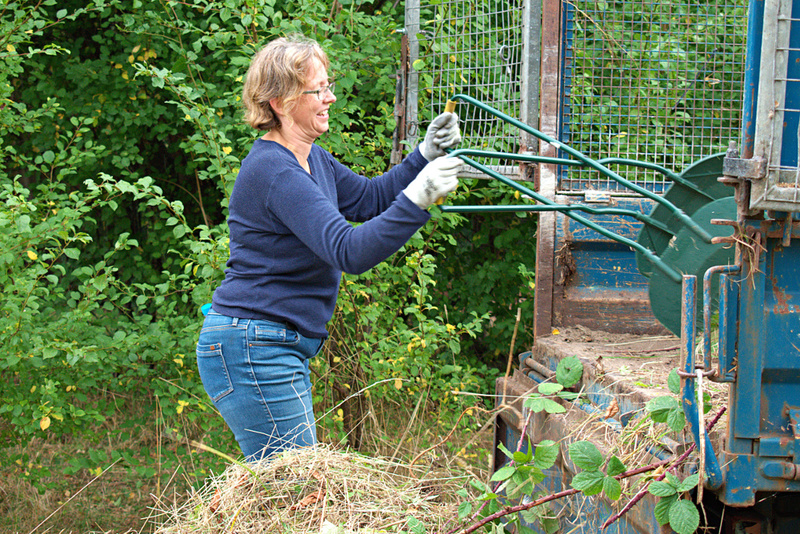 Our next Volunteer Morning is on Saturday 10th November – you’ll need to wrap up warm for this one. Did you use the Manor Park during the years 1990 – 2010 – and did you enter the park from the entrance nearest the railway bridge? Perhaps you walked your dog there regularly? Perhaps you know someone who did? We’d like to hear from you. 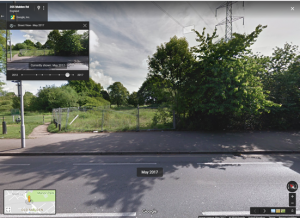 As many of you are aware the land in the corner of the park was sold off to a private individual, and around 2013 he fenced it off, and denied access to a path that used to run from the road immediately next to the railway bridge into the park. A new path was then built alongside this privately owned area of land which you may now use instead. What you may not know is that the old path, which was fenced off, was in our opinion, a legal right of way. 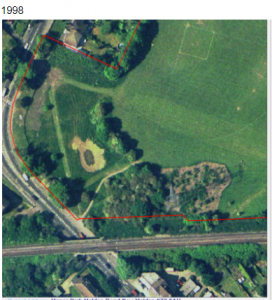 Friends of Manor Park is working with the Ramblers Association to assert this right of way. 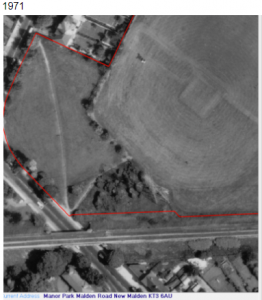 We have strong evidence from council photographs that a path existed across this land for many decades, but we would also like to hear from anyone who used this path during the period 1990 -2010 to further support our claim. NB The path is once again in use – but we’d like to ensure this remains permanently so. 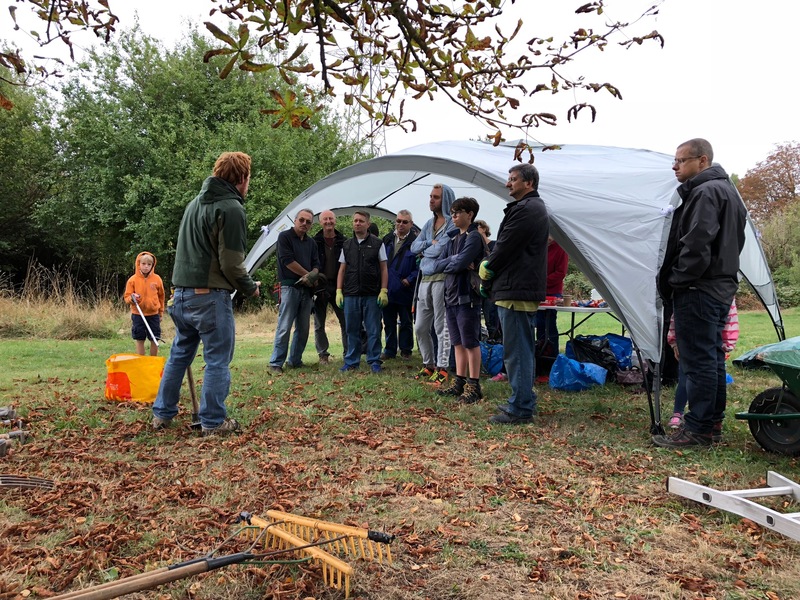 There’s been lots going on at Manor Park over the course of the summer……planning future activities, protecting a legal right of way, wildflowers, Plough pond, playground funding, pathways, and even some blackberry picking…..
We’ve been planning our next Volunteer Morning, which will be held on Saturday 22nd September 10am – 2pm. 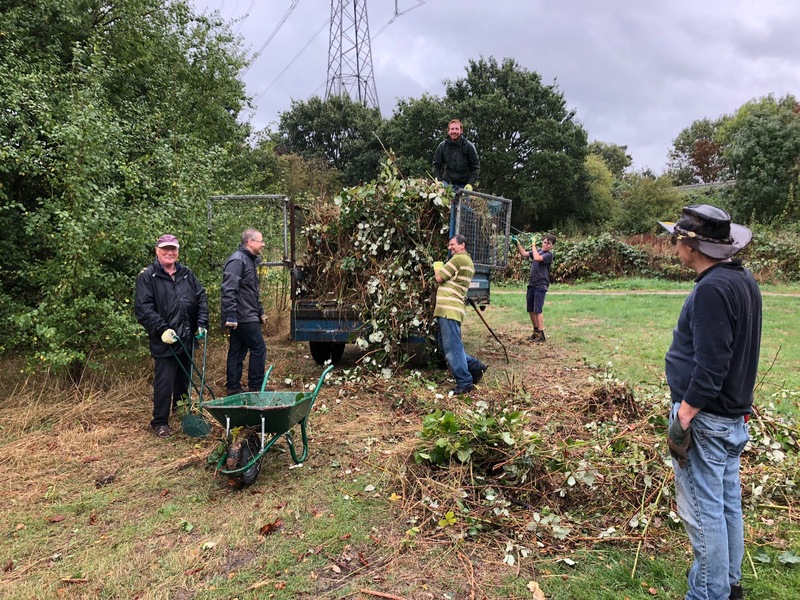 After the long summer we need to do some litter-picking to give the park a deep clean, some bramble-bashing to restrain these vigorous bushes, and put up some bat and bird boxes to encourage more wildlife. There’s a few other light maintenance jobs we’d love to get done but these depend on numbers. 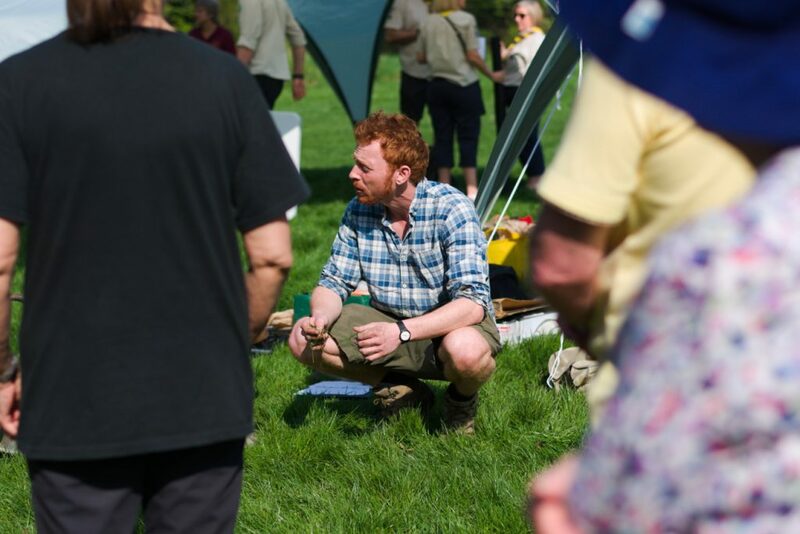 As ever we’ll be supported by Elliot Newton from the Environment Trust. These mornings are great fun – it would be lovely to see you if just for an hour. Free drinks and refreshments on offer. 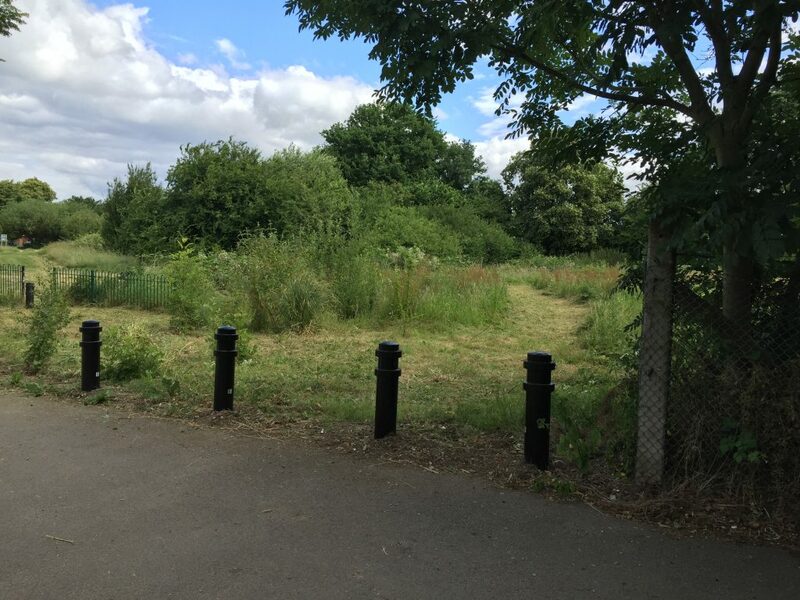 We’ve been working hard to deal with some of the issues relating to area of privately-owned land in the corner by the railway bridge. Step 1 in our plan was to get the council to put bollards across the front of the land, by the road, thus preventing travellers accessing the rest of the park. After these were installed we noticed that some kind people moved the last couple of sections of temporary fencing out of the way. It had become very dangerous with sharp metal edges causing a hazard to passers-by. This means the space is now open again. Diagonally across this land from the bridge into the main park is a path. We believe that this to be a legal right of way. A right of way exists if a path has been used for 20+ years. This path had been used for decades before the landowner blocked access. The path was strimmed back a couple of months ago. Local residents are now using it daily to enter the park – which is a sight to behold. We’ve had good feedback from the community. Our next step is to formerly assert this legal right of way. We are being supported by the Ramblers Association in this process. We intend applying for the path to be registered on the definitive map of rights of way held by Kingston Council. 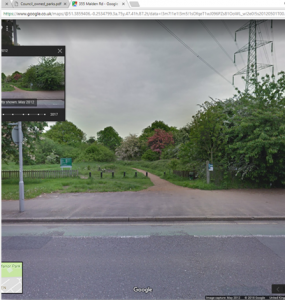 If you were one of those who regularly used this pathway before it was blocked off then please drop us a line at team@ourmanorpark.org.uk – your testimony is very important to the process. As you’ve probably guessed, if you look at our Facebook page, we’re big into wildflower meadows. Why? Well, not only are they beautiful, they’re also a food factory for insects, and a natural habitat for wildlife. 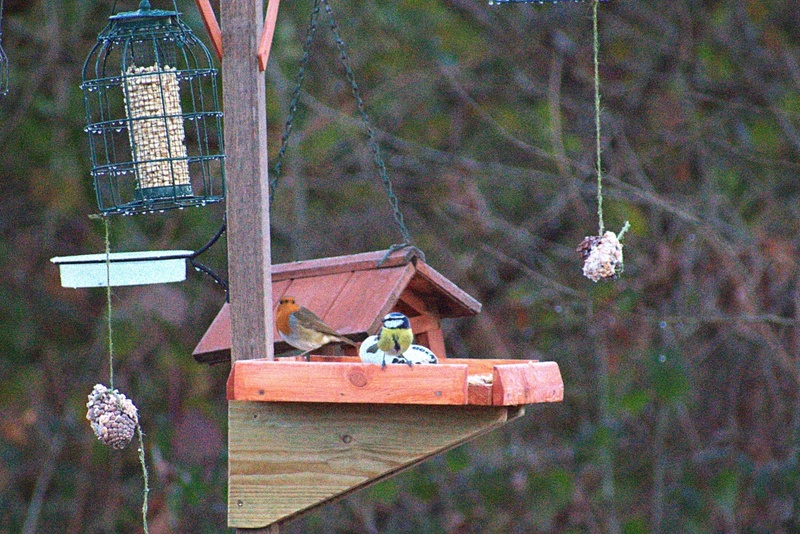 If we support more insects we get more birds and bats. At 25 acres our park offers a real opportunity to make a contribution to the biodiversity of our local natural environment. Back in April Friends volunteers planted wildflower seeds at the back of the park. These were sown into strips, where we’d first removed the existing grass. Most of these strips have taken, and we’re seeing flowers appearing. If we keep sowing wildflower seeds for the next few seasons and managing this space properly, we should start to develop beautiful areas of wildflower meadow in Manor Park. Let’s pop over the road to Plough Pond for a moment….. 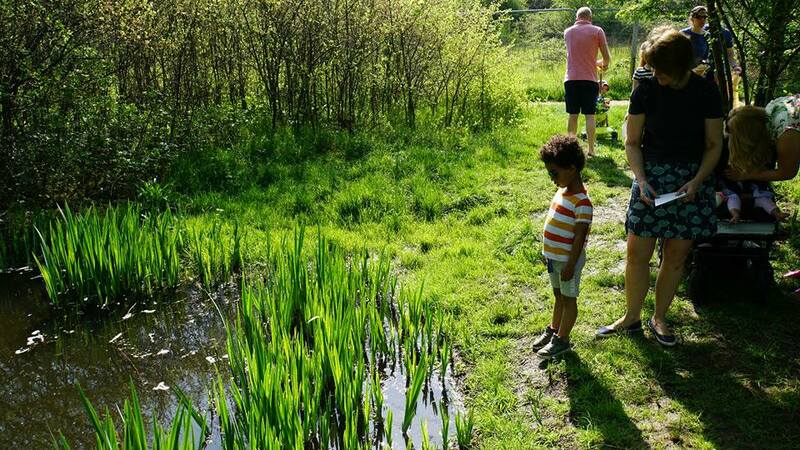 This pond is a local treasure, and a sanctuary for wildlife. It’s lovely to see the moorhen and her 4 ducklings enjoying the safety of the reeds. We often see a heron hunting the goldfish that people regularly seem to dump into the pond. Although nice to look at goldfish damage the pond’s fragile ecosystem – by munching on everything. 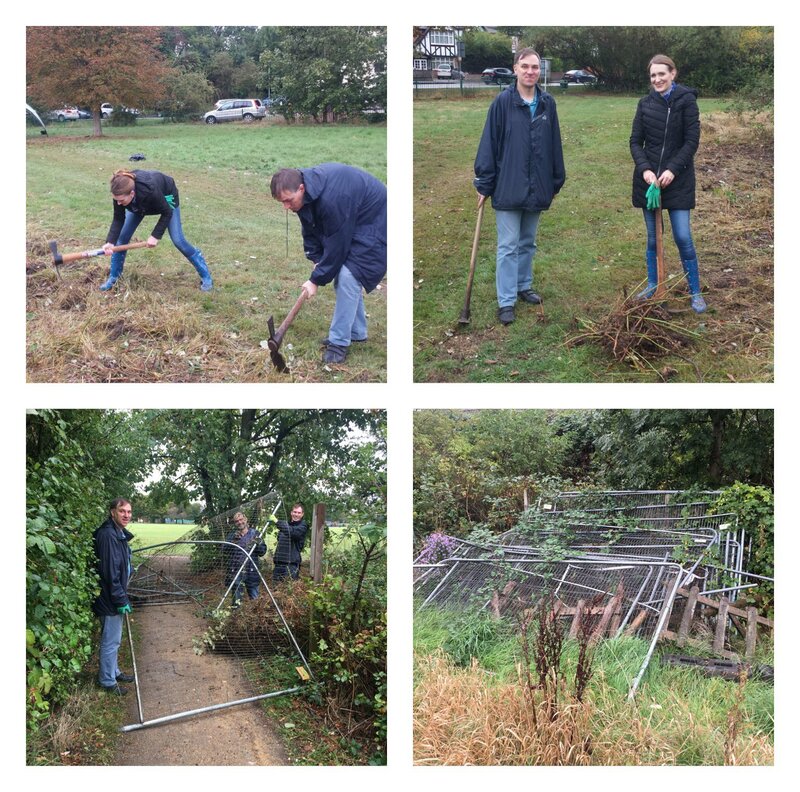 Chris Newman, a local physio, and Friends committee member, is leading the work to improve the Plough Pond space. He’s already run a couple of volunteer days to work on the area around the pond. 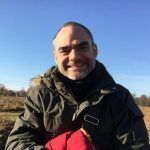 He’s now planning to launch a project to replace the fencing around the pond and add in an area of decking on the pub side of the site to allow the community better access, albeit there will still be a fence all the way around to protect the wildlife. Sarah Gromova, a local landscape designer, is currently working up drawings of what this could look like. Once done Chris will present these to the community for feedback. The plans will then be amended accordingly, the work costed up, and a period of fundraising will commence to pay for these works. 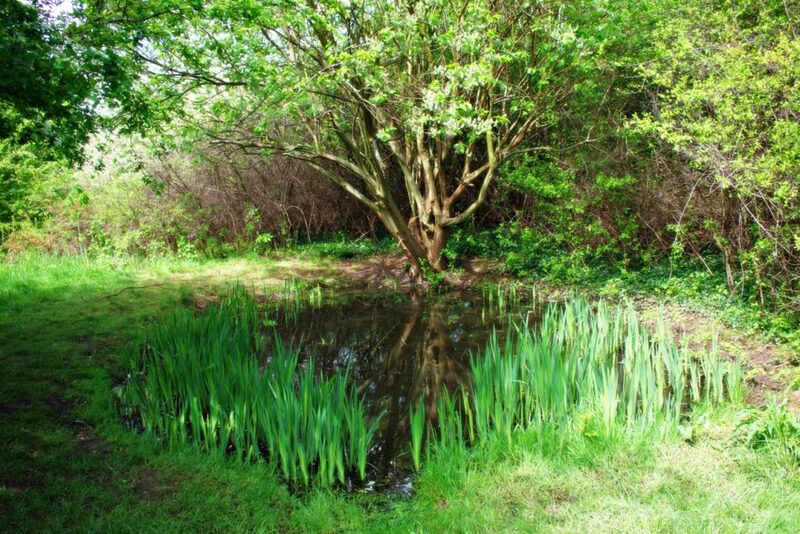 In the autumn Chris will be running another volunteer session to tidy up the green space around the pond. 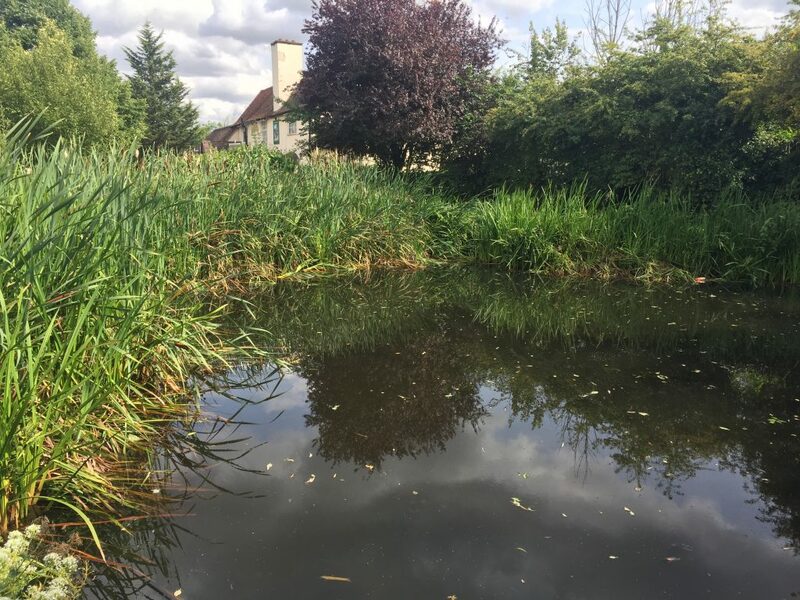 Back over to the seasonal pond at Manor Park…..
Our volunteers restored the seasonal pond and surrounding vegetation in September last year. This spring we saw the fruits of their hard work. 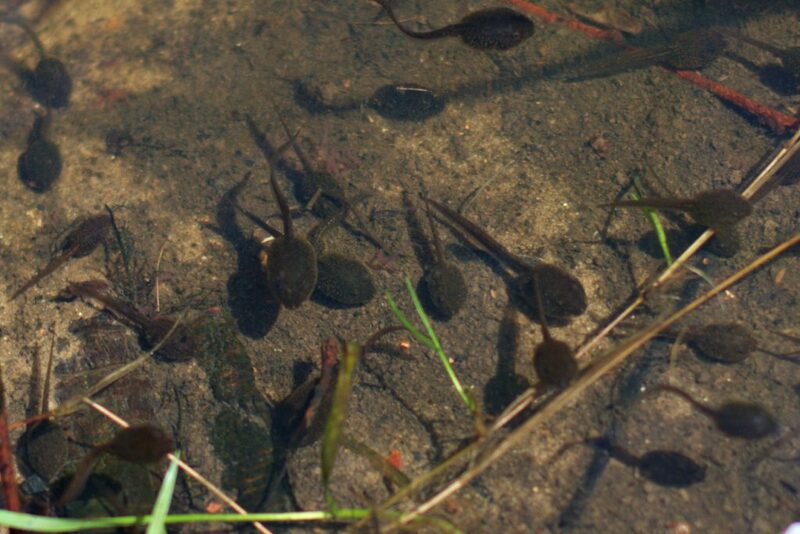 The pond looked great, and most importantly was brimming with tadpoles, newts and other wildlife. Sadly, as with all seasonal ponds, it dried out at the start of July due to the prolonged dry-spell. Some of our Friends were concerned about this, but after speaking with the Freshwater Habitats Trust we were told it was perfectly normal, and that the wildlife will be ok. The frogs and newts head into the undergrowth. The insects find other places to frequent. And the pond will fill up this coming winter in time for next spring’s breeding season. 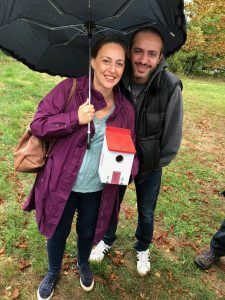 You may recall, Fiona Sowell, our committee Secretary, and Jenny Lambert led a piece of work to find out what the community wanted from the playground. Over 200 people filled in our survey. Most thought our playground was feeling tired and unloved. You also told us it failed to cater for the very young and the older children. Sadly, Manor Park is not the first-choice playground for many local children, who often ask their parents to take them further afield to Joseph Hood or Cheam Park. This is not ideal – Manor Park needs to become the 1st choice for our local community. We were told that Manor Park was due an injection of council funding (£150,000 was the figure mentioned) to spend on the play facilities, as part of the council’s rolling programme of playground improvement across the borough. This was put on hold after the elections due to the new administration reviewing the budgets, but I’ve now been told that the playground funding programme is still going ahead, although Manor Park has not been confirmed as a recipient as yet. We met local councillors at the end of July to discuss this matter amongst other things. 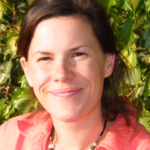 We are also meeting with Cllr Hilary Gander, the portfolio holder for Parks and Green Spaces in September. Once we know the status of the funding we will be able to progress the playground project in a manner that reflects the levels of funding open to us. 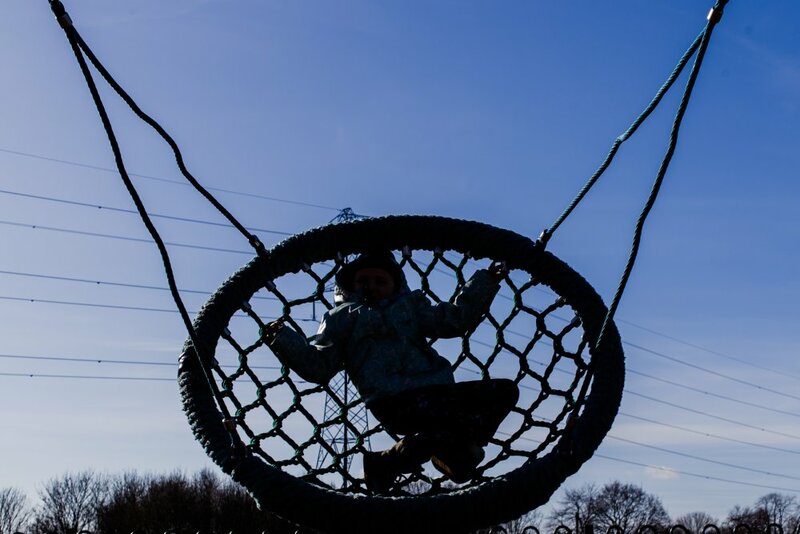 There’s no shortage of exciting ideas – zip-wires, floor trampolines, obstacle courses, more interactive equipment, multi-purpose sports courts, and we’d also like to see some play items placed around the park – log climbing activities – to encourage more exploration of the entire site. The wooded copse by the railway, immediately behind the privately-owned area of land by the bridge, is coming along nicely. We had a display of bluebells in spring. We’ve done some more work to improve the path through the copse. 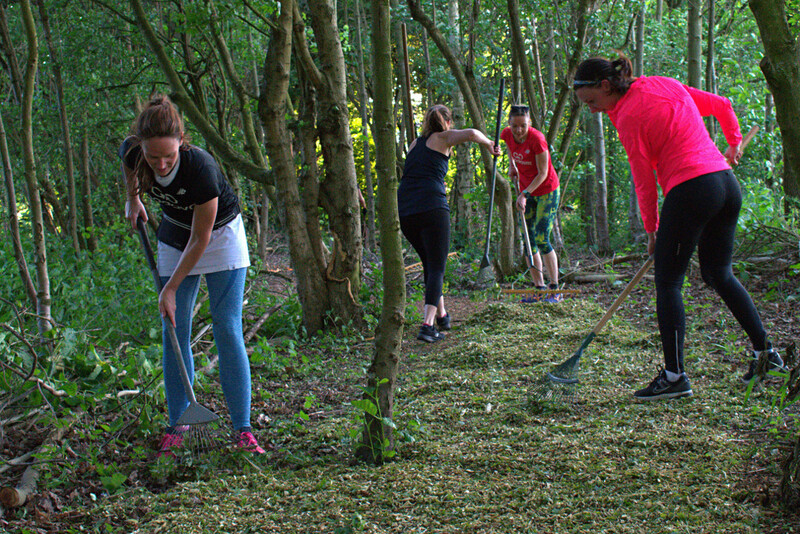 A team of volunteers from GoodGym helped cover the path in woodchip – which makes the cool walk through the copse much more comfortable underfoot – and just looks nice. We’ll no doubt be doing some more work to improve and restore this space over the winter months. It would be lovely to get some more bulbs planted for spring. We’ve been thinking about introducing a Community Orchard to Manor Park for some time. Kingston has a long heritage of orchards with some of its own ancient varieties. Between the bowls club and the railway would the ideal location. We’ve already got one volunteer who is happy to manage this, Mark Kinge, and we’re just looking for one more person. There’s not a huge amount involved, and you will get some free training. We’d like to get the orchard planted in late autumn. 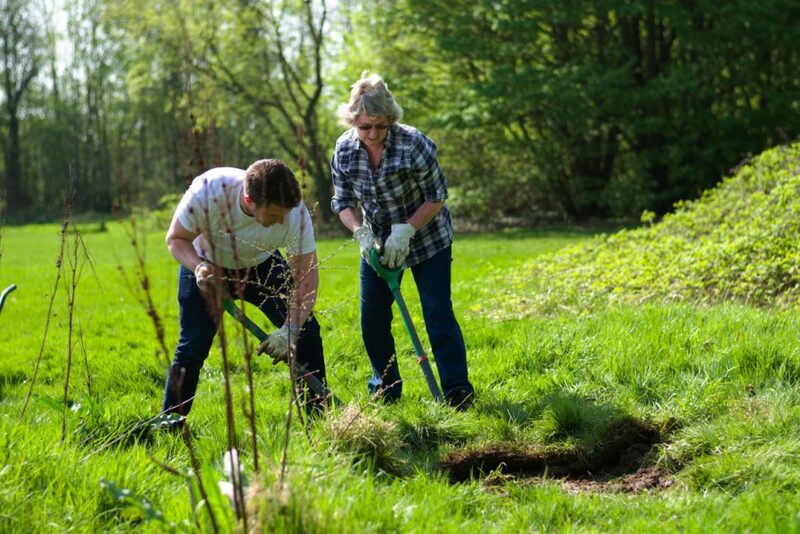 We’re thinking of running an adopt-a-tree type scheme, so local families can look after a tree – and get more involved. They’d plant their own tree, and then look after it. 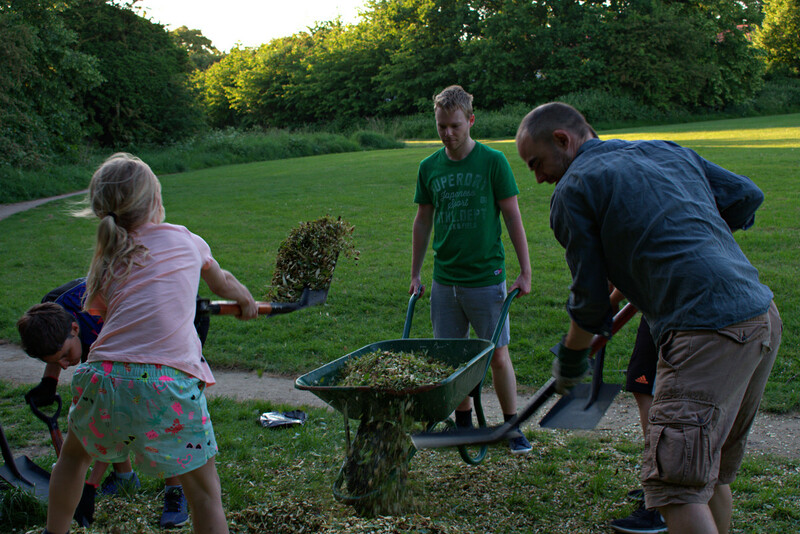 We love the idea of the park providing food for the local community – in as much as it helps people connect with nature. 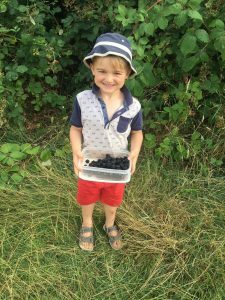 This year the park has been reasonable crop of blackberries. I hope you’ve taken the opportunity to pick some for yourself. Just be a little careful with the thorns – suggest you wear long trousers. It’s been good seeing the park used for community events recently, including the Party in the Park, and the Love thy neighbour event. 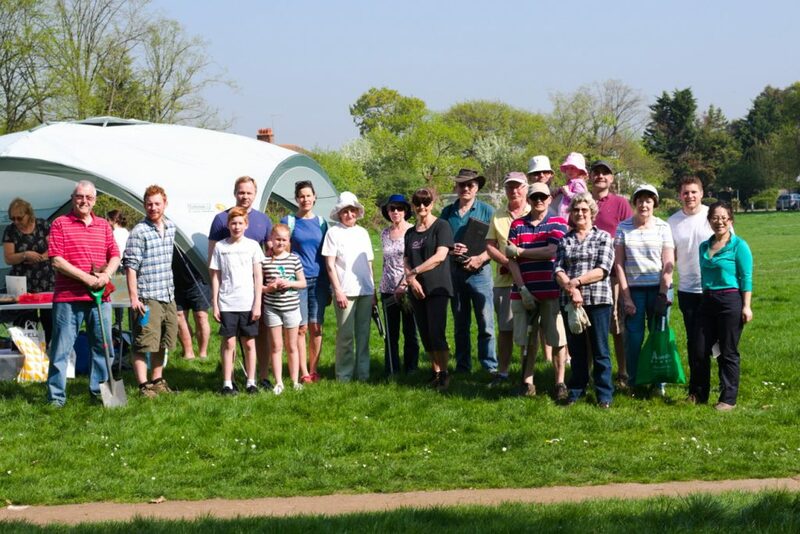 We’d like to see more community groups using the park in this way. We’d also say that if you want to use the park for an event or activity, but don’t know how to go about this, then do drop us a line. Likewise, if you are involved in organising an event and are running into difficulties, then do drop us a line, and we’ll try to help smooth things along. A few park users have complained about access to the toilets i.e. not open out of hours. We’ve managed to procure a key to get the toilets opened for evening scouting activities, but I think longer opening hours is a way off. The tennis courts, as some of you will know is run by an academy, however this doesn’t stop the public using the courts for a small fee. Just turn up and play. If the pavilion is locked, just let yourself on to the courts. The academy also offer free children’s coaching on Saturday mornings – so do take advantage of it. Our view on the tennis courts is similar to the rest of the park – that it is a community asset – your asset and therefore your right to go and use it. We’ve just heard (03.08.18) that there is a consultation about putting some temporary outbuildings on one of the tennis courts, and extending the tennis pavilion into the car park. We know little about this, but will investigate. Our job is to represent the interests of the community at the park, so we will do so with this consultation. The summer usually sees a rise in anti-social behaviour in the park, ranging from litter from picnics, to late night gatherings in the car park or in the woods at the back of the park. The latter activities are very upsetting for anyone who’s house backs on to the park. We’ve asked the police to increase patrols in the park, and have made them aware of the situation. We also need residents to call 999 every single time they see or hear anything suspicious happening in the park. Although, it may not always result in immediate action, it all goes on record and builds up a picture of what is going. The louder we shout the more that will get done. We liaise with the Old Malden police, and we have been invited to the next residents panel meeting with the St.James police. With all the recent news of travellers parking their caravans in local parks, we’ve also been working with the local council to make sure that Manor Park is secure. We ask you all to be vigilant. Please call the police if you see any suspicious. There’s a charity called GoodGym, which helps combine fitness with good deeds. The idea being that the ‘good deed’ is the thing that helps you to stick at the fitness activity. Anyway, some of you will know that the Friends of Manor Park has been working to improve the wooded copse just by the railway. The local community have worked hard to restore it, starting by thinning out trees, removing undergrowth, clearing an old path, and then planting 2,000 bluebell bulbs. At the volunteer day in April the path was partially covered with woodchip, but sadly we ran out. 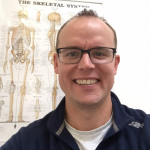 This was a task we were keen to complete…..
…..so when we were contacted by Mark Barun from GoodGym to offer the services of a group of community minded people, who would run from Kingston to our park, and do a good deed for half an hour, we leapt at the chance. We ordered a large pile of woodchip to be delivered to the park in anticipation of this free source of enthusiastic people-power. On Tuesday evening, (22nd May), 10 people ran 5k from the Guildhall in Kingston, to Manor Park, New Malden. 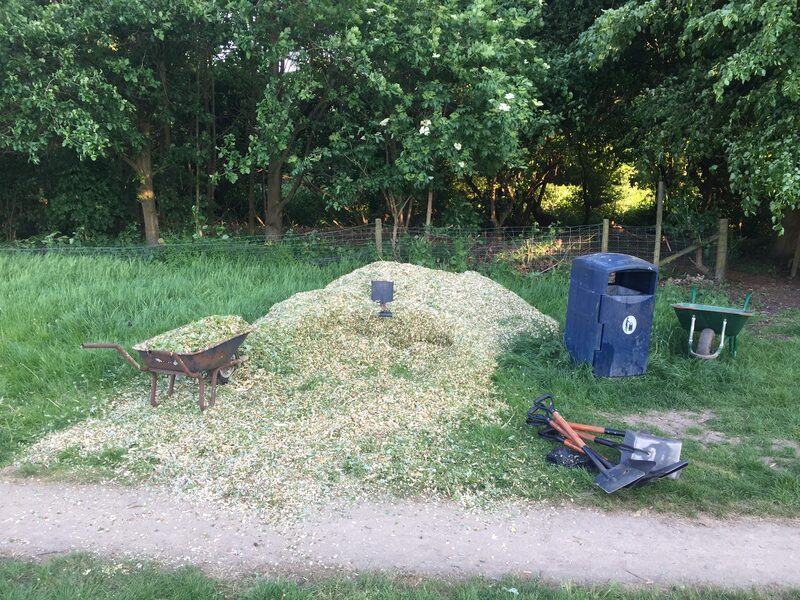 Upon arrival they set about loading wheelbarrows with the woodchip, and taking it into the Bluebell Copse, where they raked it over the length of the path. It was quite a flurry of activity – a blur of brightly coloured sportswear. Within the half-hour (their allotted time) the entire path was covered with the woodchip. It now looks fabulous. 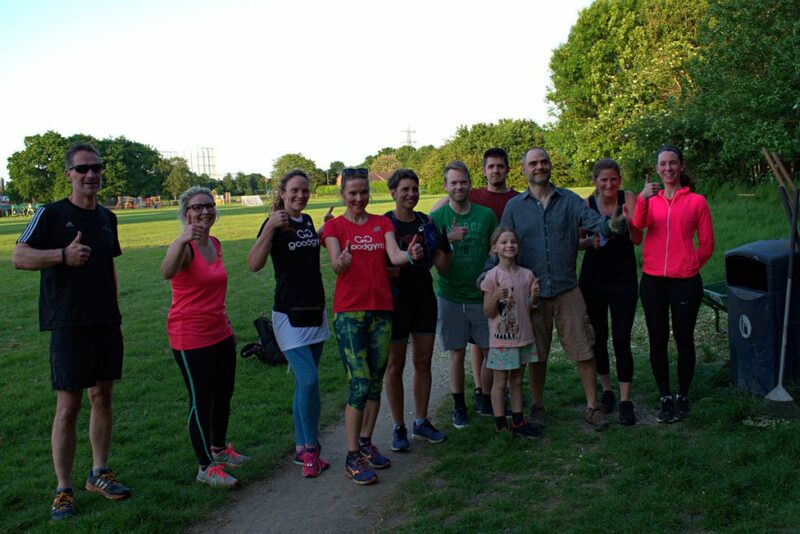 At the end of the session the group of ten GoodGymers gathered for a group pic, and listened to a few words on the work of Friends of Manor Park, then turned and headed out the park at a trot for another 5k run back to the Guidhall. It’s amazing you can get done with enough people really going at it for a short burst. We’re looking forward to working with GoodGym again in the not too distant future. 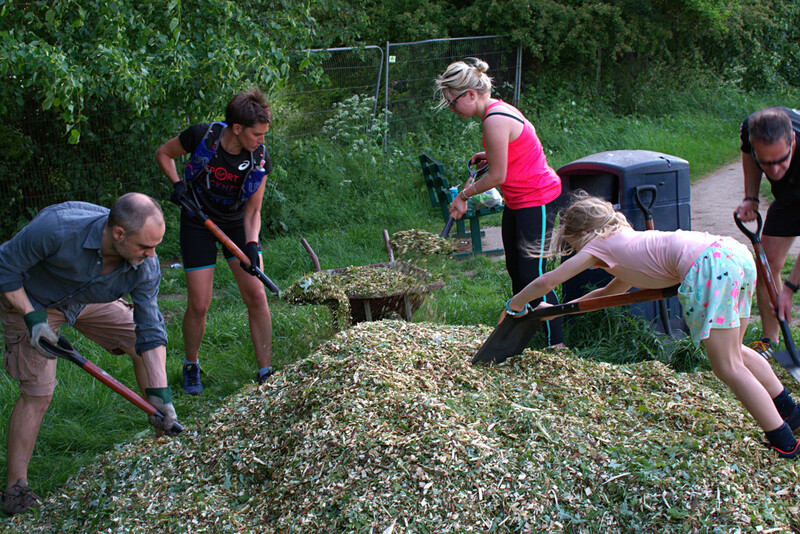 If you’ve got a good deed you think GoodGym could help with, then do drop Mark Barun an email at markb@goodgym.org. And if you’d like to offer your time to help us at the park please send an email to team@ourmanorpark.org.uk. A big thank you to the GoodGym team for helping us at Manor Park.